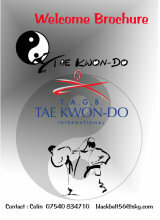 CLICK ON CONTACT US TO GET YOUR FREE TAEKWON-DO MYTHS GUIDE AND INFO BROCHURE. WHY BOOK A FREE TRIAL? A free trial lesson gives you the chance to meet the Instructors, see the club in action. and take part in a lesson. There'll be no pressure and no charge. Under 18s and children must be accompanied by a parent or guardian. Family Discounts available on starter packs and fees. Well done Isla and Jack, joint winners of "Junior student of the month" for March. Well done Elise, winner of Junior "Best grading award " for March. Well done Jackie, winner of adult Best grading award for March.